You may feel like you have never seen the night sky before when you go stargazing at !Xaus Lodge. The Milky Way arcs over you like a giant swathe of smoke – reminiscent of the Bushman tale of its origins. A girl from an ancient race, the story goes, threw the cinders from a fire into the sky to light hunters’ paths home. Prominent all through the year are the Southern Cross, Carina, and Centaurus. Hundreds of other stars and constellations nearly leap out of the blackness. The !Ae!Hai Kalahari Heritage Park that surrounds !Xaus Lodge is one of the world’s darkest places and offers some of the best star gazing in South Africa. Night really falls there, nearly totally free from pollution, including light pollution, natural atmospheric pollution and man-made pollution. On the SQM (or Sky Quality Meter, pronounced ‘squim’) scale of darkness, with 22 being as unadulteratedly dark as you can get, !Xaus Lodge and environs measure 21.9. “!Xaus Lodge is a special place to observe the night sky for a number of reasons,” says Cape Town Dr Vincent Joseph, a shareholder in TFPD and avid amateur astronomer. “Light pollution is easily controlled at !Xaus Lodge,” Joseph says. “We are actively incorporating a policy that will reduce the pollution to a minimum and allow for ideal sky-viewing conditions. We’re preparing an application to the IDA (International Dark-Sky Association in the US) that hopefully will give the lodge and the !Ae !Hai Heritage Park accreditation as a Dark Sky Park and therefore recognition as a preferred viewing site. The nearest artificial light is at Twee Rivieren Camp, some 50 km away. “Natural atmospheric pollution is reduced there as the lodge has limited rain clouds/storms,” he adds. “Plus being at an altitude of 930 m, !Xaus Lodge is already elevated in the atmosphere, thus reducing atmospheric disturbance. 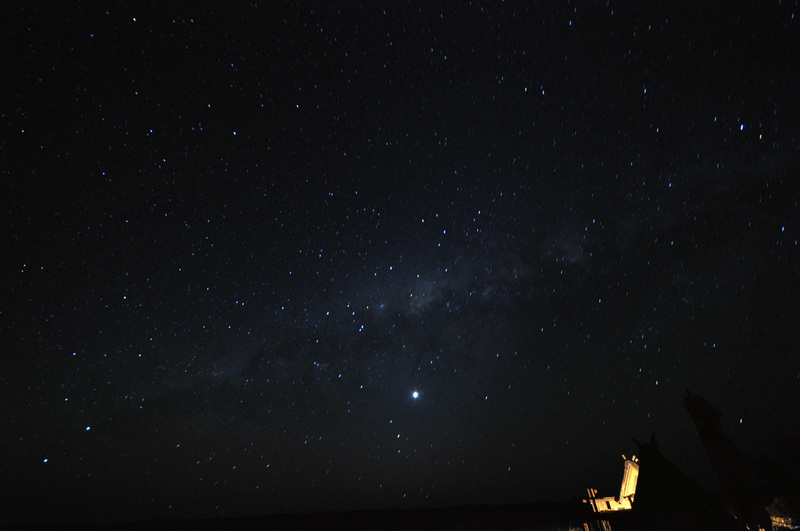 The Milky Way – our own galaxy – most impresses stargazers at !Xaus Lodge. “On a moonless night it is so bright that one can use it to walk unaided in the desert,” Joseph says. Like the hunters of old. Aside from the planets, constellations and associated stars in our own galaxy, Joseph says, there is great interest in objects outside our galaxy in ‘Deep Space’. “During the early 1900s, astronomers were unaware that there were other galaxies outside our own Milky Way,” Joseph says. “When they saw a small fuzzy patch in the sky through their telescopes, they called them ‘nebula’. The best way to appreciate the sky at !Xaus Lodge is in the company of local people, whose indigenous knowledge and traditional skylore reflect a reverence for the sky and everything in it. 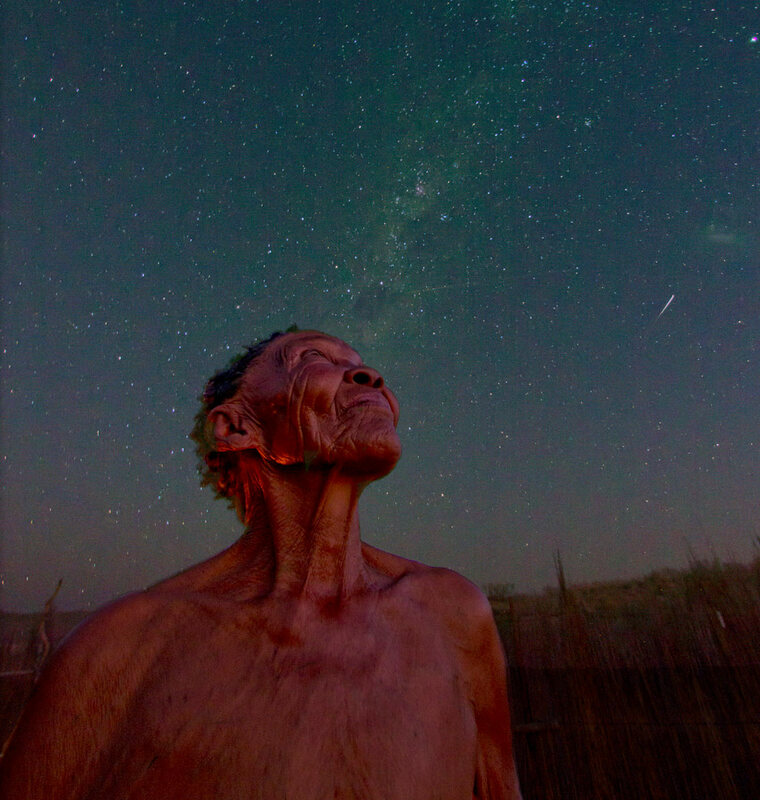 To many Bushmen, particularly, the sky is a spiritual realm, and the stars are human and animal kindred spirits – either departed from this world or yet to arrive. The tale of how the sun was once a man from whose armpit shone rays of light. He lived in a hut and kept the light to himself. Children were sent to throw the sleeping sun up into the sky, where he now shines, except at night when he draws an old blanket over himself to stay warm. The stars are the holes in his blanket. Or a tale of the Moon – according to Bushmen legend, actually an old shoe that Mantis threw up into the sky to guide himself. As it rises it is red with desert dust and just as cold as old leather. Standing outside on !Xaus Lodge’s elevated decks, in the dark silence penetrated only by the clicks of barking geckos, or perhaps a distant lion’s moan, you can look into infinity in the sky overhead, and perhaps imagine also what the Bushmen believed: their shamans, once in trance, would climb invisible cords stretching skywards to consort with the ancestors. Clarissa Hughes’ book, Flowers in the Sky (2012), is a lovely book on southern African starlore. Visit !Xaus Lodge to learn the truth of the saying: During the day you see the world. At night, you see the universe. Are you a South African or SADC resident? Contact us to take advantage of our special rate offers.